My globetrotting cyberworld friends Brian and Shannon give some superb perspective on where we as a nation have been, where we might be headed, and how utterly blessed we are today–far more blessed than we realize when the present is framed against the not so distant past of characters such as, say, Ozzie and Harriet. Very well done, Brian and Shannon. And Happy Travels as well as Happy Thanksgiving. For some strange reason I found myself thinking about super powers the other day. Not about how cool it would be to have one but mostly about how useless they’d be in the real world. Without a horde of super villains to fight against, what practical good is super strength anyway? For the most part comic book abilities seem better suited to creating mischief than doing anything productive or interesting. The one exception I happened upon was time travel. Not necessarily even to mess with stuff. You don’t need the ability to change the past or profit from a preview of tomorrow’s headlines to make time travel totally awesome. Simply being able to observe the universe unfold over a period longer than a human lifespan makes it a power worth having. And so we begin this posting with a truly great rock n’ roll song from the Irish bloods Dolores O’Riordan & the fabulous Cranberries. . . with music so apropos at Thanksgiving. Go together like too much mince-meat pie and too much pumpkin pie with the excessive mince-meat pie. And then there’s apple pie. All followed by the guilt of all that sugar on top of all that turkey/ham bloating. Oh well. This feast only comes once a year. But then there’s Christmas excess. Praise God and Elvis and pass the gravy. Where to begin to pause and give thanks to the Almighty for all the blessings??? I never know where to begin to give thanks for all the many blessings God has showered me with for nearly 62 years. And anyway, I celebrate a personal Thanksgiving every day in prayers. But do have to give special thanks to God for the warmth and love of children and grandchildren I’m with tonight in a visit to the fam in Texas. And thanks to all the friends from all the way back to kindergarten in Navasota, Texas Our Texas (special thanks to “Big Hal” for being there at the airport in Houston for me; boy was it great to see a lifelong friend’s Texas face at the airport, Big), and to all the great friends along the way (thanks so much for the time in the remodeled guest room and hospitality and great fun north of Dallas, Charlise & Peter). 1) Hot turkey (must be dark meat), dressing and gobs of gravy and homemade biscuits. 2) Mince Meat pie like my Mama Goldie always made. 3) Pumpkin Pie like my Mama Goldie always made. 4) Great parents Deanie and Goldie I had (R.I.P., Goldie & Deanie; miss you every day of my life). Boy do I love cranberries at Thanksgiving and Christmas too; so here’s some Dolores O’Riordan and the fabulous Irish bloods “The Cranberries” music therapy for you. And now . . . . .
no matter how things turn out at the end of this day the Lord hath made, in which we should rejoice and simply be glad in it no matter what it brings, all the way to the end of the day–about half the country is going to be intensely full of the fear of either “four more years” or of Gov. Romney’s new ownership of the world’s most stressful job. Good Lord, I wouldn’t want it. I couldn’t handle such a job and manage that endless, endless pressure. I couldn’t handle it for five minutes. Nor, most likely, could you. Ya think? Around half of our people (actually not true, since so few actually still vote in this country) will be overwhelmed by anger and bitterness, full of incredible grief and sorrow and a lot of other overwhelming emotion. And that’s just the Christian voters. Oh boy, ain’t we got joy over at Grandma’s table down on the farm THIS year, as half those at the table are still stewing within their hearts and souls and those on the other side of the festive table are grinning like Grandma’s cat that ate the canary. Only YOU can prevent forest fires of toxic, rancorous feelings of bitterness, hatefulness, fear of the future, and all of it generated by the grief and sorrow of losing and having to process all that emotion that you have invested in some politicians with “their” pundits on “their” sides. Those are folks with the microphones and pens who are always perfectly willing to keep us so worked up emotionally that we behave like anything but people of peace and grace and faith, our friends and family included. I’ll plead guilty for any of my own guilt here, by the way. And try to be evermore mindful of the kind of feelings I’m stirring in somebody who reads the blog here or who I deal with. But let’s just try to remember that only YOU can keep yourself in your relief and your elation over a win from rubbing the outcome of this election into the face of those on the “opposing side” in this nasty state of political and cultural and terrible warfare we’re all trapped in. Only you have the POWER over YOU and your emotions you’ve invested so much an this election, whether positive or negative emotions. As for me, I am going to choose life and thank God that God gives me that option every minute of every precious day and night on God’s gracious and loving earth. Grace and peace catch you some other time–I have roses to go smell. 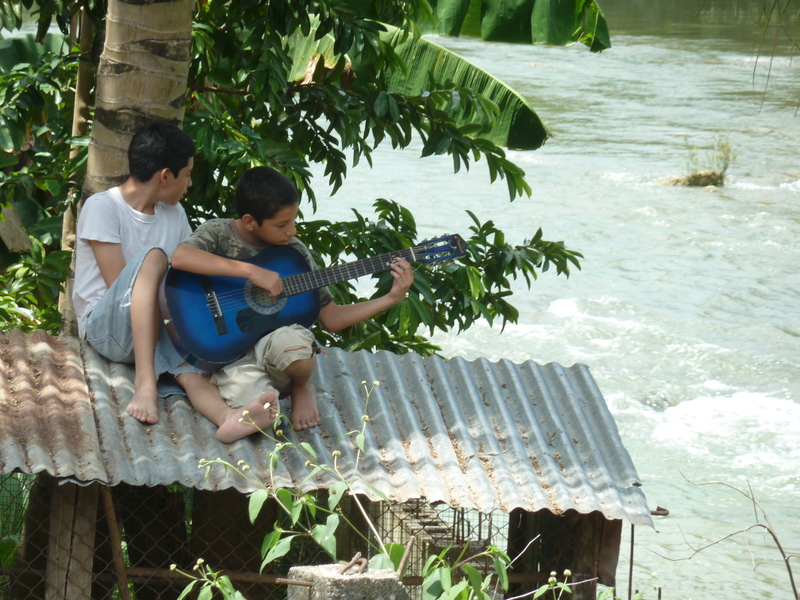 BUDDING YOUNG MUSICIANS ON THE ROOFTOP OF THE GUITARIST’S HOME OVER THE MOPAN RIVER IN THE VILLAGE OF BENQUE JUST DOWNRIVER FROM MY HOME VILLAGE IN SUCCOTZ, BELIZE. THESE TWO ARE STARTING TO WRITE SONGS TOGETHER AND GO UP ON THE SHED ROOFTOP FOR INSPIRATION. WHO KNOWS: COULD BE ANOTHER LENNON/MCCARTNEY BUDDING HERE, ALTHOUGH, ADMITTEDLY, THAT ISN’T LIKELY TO BE HOW THEY TURN OUT IN THEIR FUTURES. BUT THEY’LL BE ENRICHED FOREVER BY THE CREATIVE PURSUIT THEY TOOK UP IN A TOUGH PLACE TO GROW UP IN. AND COME TO THINK OF IT, THESE TWO KIDS, WHO DON’T HAVE MUCH IN TERMS OF WESTERN MONEY AND MATERIALISM, ACTUALLY HAVE A LOT THAT RICH OR WELL-TO-DO YOUNG AMERICAN KIDS DON’T HAVE. KIDS IN THESE COUNTRIES TEND TO BE VERY CREATIVE AND VERY RESOURCEFUL (IF THE DRUG PIGS WITH THEIR “EASY CASH” DON’T GET TO THEM) BECAUSE BEING VERY CREATIVE AND VERY RESOURCEFUL IS SOMETIMES THE ONLY TWO LIFE TOOLS YOU HAVE. 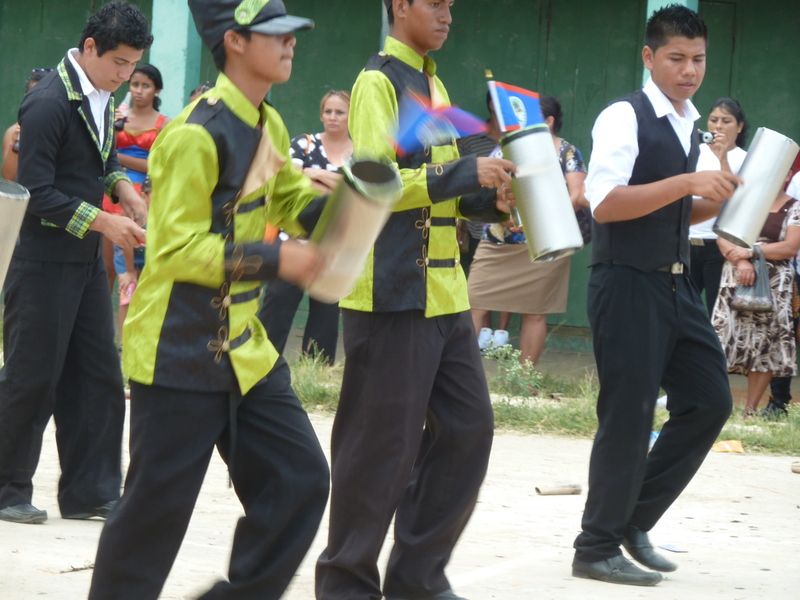 FROM THE BELIZEAN INDEPENDENCE DAY PARADE, HERE IN THE VILLAGE OF SUCCOTZ IN FAR WESTERN BELIZE, BACK IN SEPTEMBER. THE PARADE CAME RIGHT DOWN ONE OF THE VILLAGE’S FEW SMOOTH, PAVED STREETS NEAR MY CASA. BELIZEANS SEEM TO LIVE FOR THE NEXT FESTIVAL AND PARADE AND EVERY TOWN AND VILLAGE HAS A MARCHING BAND AND THOSE KIDS PRACTICE INCREDIBLY LONG HOURS GETTING PREPPED FOR THEIR APPEARANCES. AND NOW WITH THOSE ASIDES MENTIONED and with no further of that old-time ado. . . . . Happy Sunday, all of you of the Cult of the Jitterbug, and may God shower His/Her endless love, grace & tender mercies on you as I get my heart and mind prepared for worship with the Anglicans later. 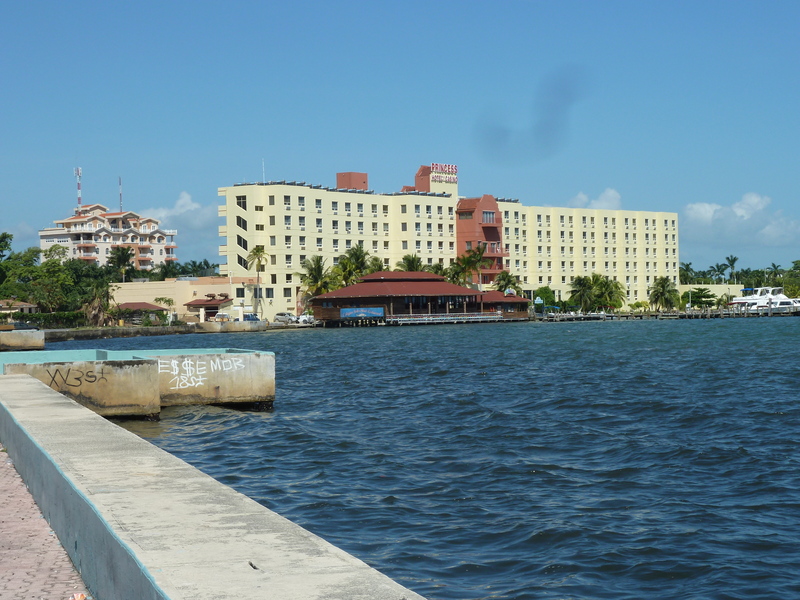 View of the Princess Hotel & Casino in Belize City where you can live out your fantasy as a high roller for a night or two before you leave the port town for the real fun and relaxation that awaits you in the Romantic Paradise that is the playground of Madonna and the paradise where Bill and Mrs. Gates keep their biggest boat afloat at one of the many Eden-like, Belizean islands. As much as I’ve come to abhor gambling and casinos with their lure of money for nothing in lieu of working to earn and save your money–I’m nothing if not a staunch, true-blue conservative–I enjoyed a great buffet breakfast with a gorgeous view at the Princess my own self recently. Jesus will love this casino when He comes back. He can buy a beer for breakfast and smoke cigarettes at the breakfast table to his Christ heart’s delight. And Jesus is going to have a great time at the craps table with all those hard-working American Christians blowing their savings and charity monies, I’m sure. 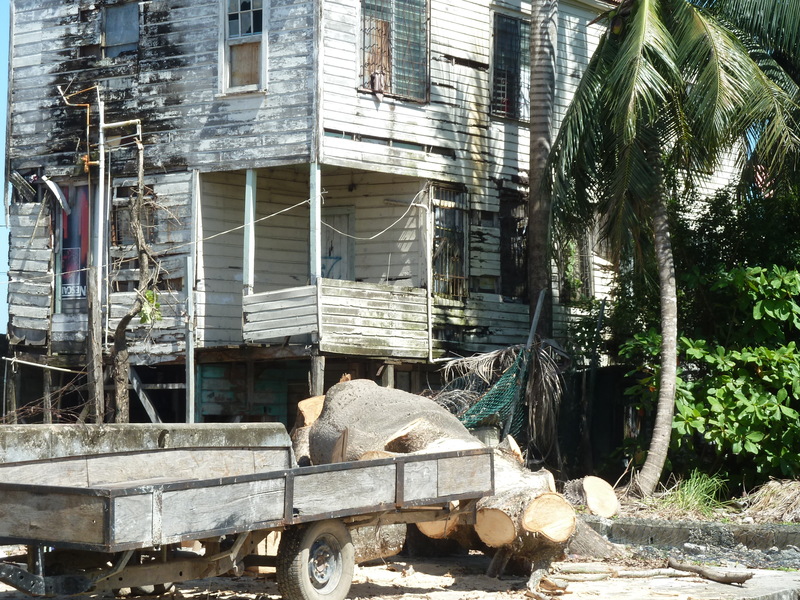 Reality bites: A Belizean home to a multi-generational family–God help them–two blocks down. 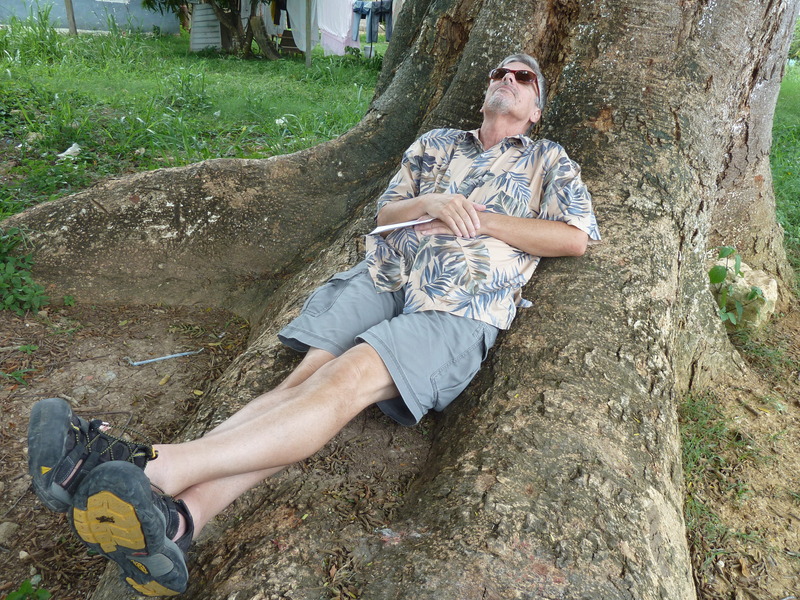 And it occurred to your favorite blogger and old-fashioned American conservative here in the Paradise of Belize–where all that glitters below the surface of life for struggling Belizeans is not all gold and glamour–that your favorite blogger has not played the Jitterbug Theme Song from His Greatness Billy Preston in a long, long time. And so here’s Billy performing with his best friend and God-loving soulmate George Harrison at the live aid concert that was the first of its kind and remains one of the greatest shows in Rock and Roll History–where George himself looks stunned as Mr. Billy suddenly jumps up and goes all Holy Ghost/Pentecostal with Jitterbug legs that won’t quit.